We don’t work through intermediaries charging commissions. The people you speak with to organize the program are the same ones who will be on-site when you arrive. We have a vested interest in making sure everything works out as promised. From classes, to trip excursions, to cultural visits, to activities, to language exchanges, to community service and internship opportunities, we will work with you to design the perfect program that meets your goals and fits your budget. Registration and payment can be done online…it’s that simple! Our multi-lingual staff is available 24 hours a day/7 days a week to help with any issue whatsoever. You can rest assured that we are looking out for the best interests of you and your students. Chaperone teachers do not have to pay anything to travel with us. The accommodation is provided by Centro MundoLengua in a host family or in a hotel according to your preferences. The activities and trips are totally free. You also can earn incentives like stipends and free courses. During their free time, our teachers can enjoy an extra program to enjoy the city, the gastronomy, and the culture with our program directors. You will be able to relax and enjoy the travel experience! Travelling with Centro MundoLengua is giving your students the opportunity to have an important and life-changing firsthand contact with the language and culture. The trip will bring their classroom Spanish experience to life! “I first attended a Centro MundoLengua workshop in 2006. Since then our students have participated every year in independent summer programs or on teacher escorted trips during Spring Breaks. Over 100 Chagrin Falls High School students have enjoyed the experience. Several alumni have returned to Spain for university semesters thanks to their positive experiences with the program. The Centro MundoLengua classes are engaging because of the excellent teachers, the cultural components are interesting because of the experienced guides, and the home stays add an element that cannot be duplicated in a bus/hotel trip. My students are unanimous in their positive reactions to the program.” Carole F., Chagrin Falls High School. “After 10 years with Centro MundoLengua, I am convinced that this is, without a doubt, the safest, most-rewarding and best-organized opportunity for high school students. 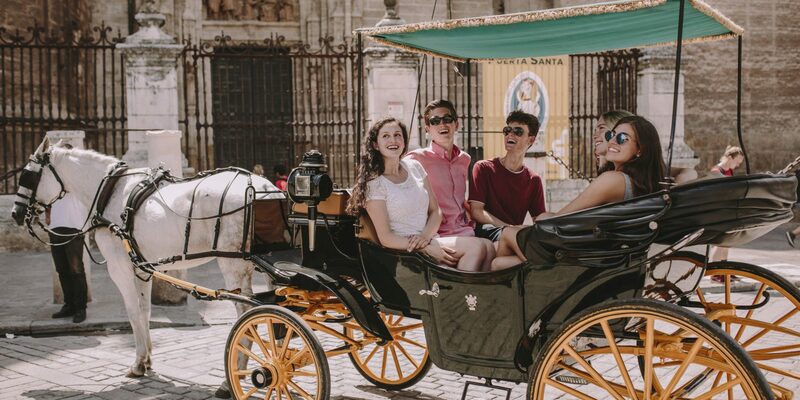 Unlike tour operators, Centro MundoLengua allows the students to immerse themselves in the language and culture, discover a new city (as opposed to riding a bus around the country) and grow independently in their experience abroad. The directors and instructors interact with students on a daily basis; this is unique to Centro MundoLengua. The host families are carefully chosen and evaluated multiple times throughout the year. The courses are well designed and tailored to meet a wide range of students' abilities. Centro MundoLengua programs are intentionally kept small in order to better serve the students and teachers. I have never had a student return from the program who was not energized, confident and passionate about Spanish.” Ken S., Chapel Hill HS. “Yo he viajado dos veces a Sevilla con Centro MundoLengua en el spring break del 2011 y en el 2013. Ambas visitas fueron todo un éxito entre mis estudiantes. Yo estoy muy satisfecha con la organización del programa bajo la dirección de David y un equipo maravilloso. Yo lo recomiendo como una experiencia cultural y de inmersión en la lengua muy positiva e inolvidable. Adicional a esto, Sevilla es una ciudad muy hermosa donde en cada rincón puedes apreciar aspectos de la cultura y tradición Andaluza. Todas las personas que trabajan para ML están bien preparadas y han sabido cómo tratar a las chicas americanas.” Aury B., Atlanta Girls School.